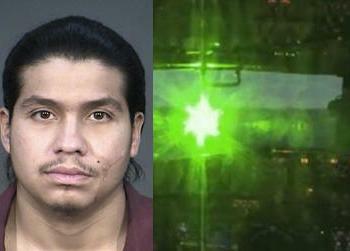 March 11, 2014 - Sergio Patrick Rodriguez, 26, of Clovis, Calif., was sentenced on Monday to 14 years in prison for aiming a laser pointer at Fresno police helicopter Air 1, and attempting to interfere with its operation. Rodriguez and his girlfriend, Jennifer Lorraine Coleman, 23, were both convicted by a federal jury after a three–day trial in Fresno in December 2013. According to evidence presented at trial, Rodriguez and Coleman used a high-powered green laser pointer to repeatedly strike the cockpit of Air 1 during a clear summer night in 2012. Air 1 had responded to the apartment complex where Rodriguez and Coleman resided near the Fresno Yosemite International Airport to investigate the report of laser strikes on Air George, an emergency transport helicopter for Children’s Hospital of Central California. The laser pointer that Rodriguez and Coleman used was 13 times more powerful than the permissible power emission level for hand-held laser devices. The crew members of both Air 1 and Air George testified that the laser strikes caused significant visual interference. In imposing the sentence, Judge O’Neill considered not only the severity of the offenses but Rodriguez’s significant criminal history, numerous probation violations, and Bulldog gang affiliation. In addition, Dr. Leon McLin, a Senior Research Optometrist for the Air Force Research Laboratory who testified at trial, indicated at sentencing that the laser pointer that Rodriguez used was an instrument capable of inflicting serious bodily injury and, indirectly, death due to a high potential for crash caused by visual interference. “Deliberately pointing a laser at an aircraft is a criminal act with serious safety repercussions,” said FAA Administrator Michael Huerta. “We applaud law enforcement agencies and the U.S. Attorney's Office for their efforts to combat this serious problem.” Sentencing for Coleman is set for May 12, 2014. She faces a maximum statutory penalty of five years in prison and a $250,000. The actual sentence, however, will be determined at the discretion of the court after consideration of any applicable statutory factors and the Federal Sentencing Guidelines, which take into account a number of variables. According to the FAA, there were 3,960 reports of people shining lasers at aircraft in the United States in 2013.